Hindus are disappointed over reported ban on yoga classes in the premises of St. John the Baptist Church Coley in Halifax (West Yorkshire), a parish of the Church of England. Distinguished Hindu statesman Rajan Zed, in a statement in Nevada (USA) today, urged St. John’s Vicar Cannon James Allison, Huddersfield Bishop Jonathan Robert Gibbs and Leeds Bishop Nick Baines to show some maturity by re-visiting the issue and not deprive area residents the valuable opportunities the multi-beneficial yoga provided. Zed, who is President of Universal Society of Hinduism, indicated that such attempts to ban yoga would leave many in 21st century multicultural England seriously disappointed, embarrassed and unhappy; many of whom might like to explore various valuable benefits yoga offered. He urged Archbishop of Canterbury Justin Welby to intervene in this matter to allow yoga classes in the premises of St. John’s to bring goodwill among the communities. Rajan Zed also urged United Kingdom Prime Minister Theresa May and West Yorkshire Combined Authority Managing Director Ben Still to look into how St. John’s, a parish of Church of England which reportedly received government funding, could ban classes of ancient and highly useful practice of yoga. United Nations proclaimed June 21 as International Day of Yoga to raise awareness worldwide of its many benefits. According to US National Institutes of Health; yoga may help one to feel more relaxed, be more flexible, improve posture, breathe deeply, and get rid of stressAccording to a recent report of US Centers for Disease Control and Prevention: “Yoga is the most popular complementary health approach in the United States - used by 14.3% of the adult population, or 35.2 million people”. Yoga was the repository of something basic in the human soul and psyche, Zed added. Rajan Zed stresses that in our shared pursuit for the truth; we can learn from one another and thus can arrive nearer to the truth. Zed invited Vicar Allison to study a treatise on yoga and attend few yoga classes to have firsthand experience of yoga. St. John’s (church on a hill), a “friendly congregation” and “a fully accessible church” which claims to “bring comfort to those who are hurting or in need” and which welcomes “visitors with the love”; describes itself as “a community of friendly people challenging the stereotypes”. 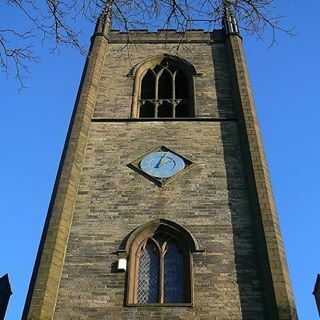 It covers the parish of Coley and Norwood Green between Bradford and Halifax, and its history dates back to 1499. The Church of England talks of “love for others” and “engage positively with other faiths”.